I enjoy eating comfort foods like mashed potatoes, but what I don’t love is how heavy and full I feel after indulging in a big meal. 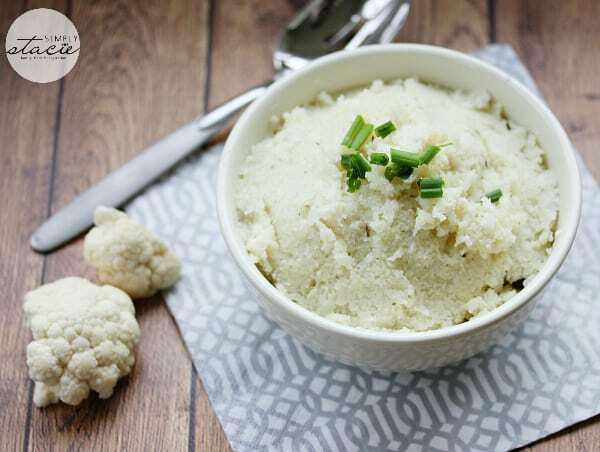 To save on the starch and extra carbs, I’ve found the perfect replacement for this traditional side dish: Vegan Mashed Cauliflower! I first found this recipe on Food.com and liked how straightforward it was to make. It took less than 20 minutes to make from start to finish and included ingredients that I already had on hand in my fridge and pantry. As someone who strives to live a healthier lifestyle, I am making small changes in the foods I’m preparing for my family. Fresh veggies are in bloom and I’m fully taking advantage of the local farmer’s markets this time of year. What I love about this recipe is that it actually tastes good and even kids enjoy it! It’s smooth, creamy and seasoned with spices and fresh garlic. The best part, though, is that you don’t feel heavy and full after eating supper. Think of this recipe as a guilt-free and simple way to add extra fresh veggies to your meal rotation. You might also like this Vegan Mexican Casserole. 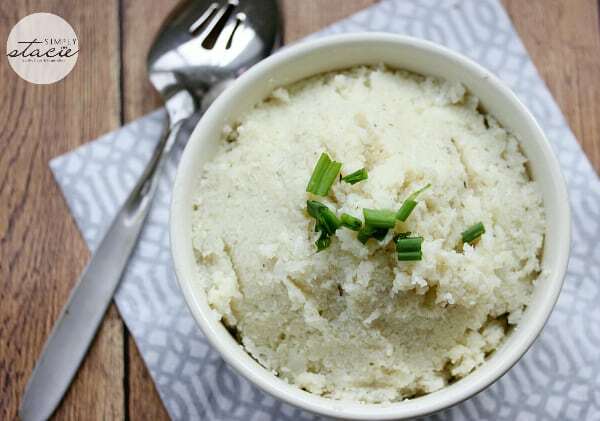 A healthy and delicious alternative to traditional mashed potatoes. Steam cauliflower until it’s soft (about 12 minutes). Drain excess water in a colander in the sink. Mix together the cornstarch and 2 tbsp water in a small bowl and set aside. While the cauliflower is steaming, combine Silk soy beverage, water, garlic, Italian seasoning, salt and pepper in a small saucepan on the stove. Cook over medium heat, stirring occasionally, until it reaches a boil. Then add cornstarch/water mixture and stir constantly until the sauce has thickened. Remove from heat. Put the steamed cauliflower into a food processor. (You could also use a hand blender.) Process for about one minute. Then add your sauce and process until the cauliflower is mashed and sauce is fully incorporated. If you find it too thick, you can add a little more Silk soy beverage and then process again until it reaches your desired consistency. If you need to re-heat, pop it into the microwave for about 30 to 45 seconds. Serve hot. Garnish with green onion, if desired. 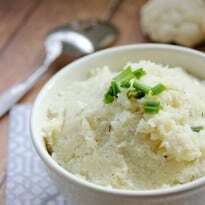 We love cauliflower but have never had it mashed, guess I should give it a try. Thanks for the recipe. I’m such a fan of mashed cauliflower. I’ve served it in lieu of potatoes a few times and no one noticed! I love to try new versions. Thanks for sharing! Cauliflower is high on my list of favorite vegetables and I think it gets overlooked too often. 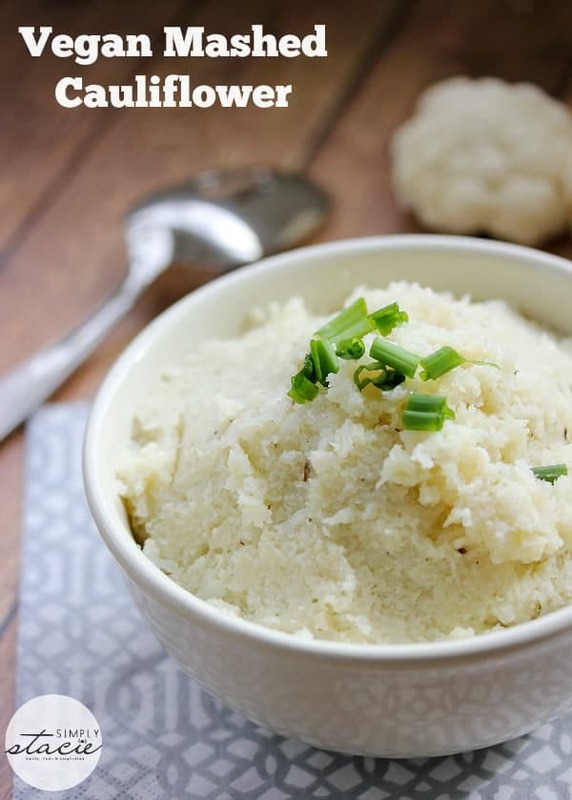 This is a great idea to replace mashed potatoes–my husband likes to eat low carb. Pingback: 30+ Delicious Low Carb Side Dishes - Wife. Mom. Geek.